Nestled amidst the snow capped Dauladhar range in Kangra, McLeodganj and its twin town Dharamshala have been spiritual abodes for years and also home to the Dalai Lama. However, in the last couple of decades, McLeodganj has grown into a popular backpacker destination with travellers and adventure enthusiasts rubbing shoulders with the red robbed monks in the alleyways of this hill station. There is an eclectic vibe of cultures, cuisines, shops, cafes and music across the town as the place offers myriad things to every kind of visitor. Also referred as Little Lhasa, McLeodganj was a British outpost in mid 19th century when they shifted from Kangra. However, a devastating earthquake in early 20th century made the British shift and it was after the Dalai Lama made this his home that McLeodganj began to flourish again with a huge Tibetan contingent. Further, it has now become a sort of hippie town with visitors and travellers from all walks of life heading to this hill station. Here is a list of must visit places while in McLeodganj. 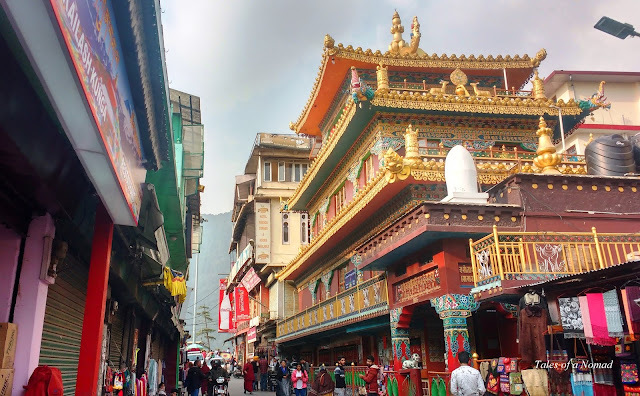 Probably the most popular place to visit in McLeodganj, the temple complex is the heart of the town with Dalai Lama’s residence and Buddhist temples. The main shrine has a gilded Buddha statue with statues of Padmasambhava and Avalokiteshwara next to it. It also houses numerous Kagyurs and Tangyurs which are teachings of Buddha and interpretations of the teachings respectively. The other temple known as Kalachakra is quite a colourful one with gorgeous mural art adorning its interiors. The complex is home to a huge contingent of Buddhist monks and if you are lucky you could catch them during a session of discussion on their learning which is an interesting watch. The complex also houses a Tibetan war memorial and a Tibetan museum which has displays of Tibetan history, photographs and numerous stories of their hardship during the invasion by China. Located amidst the tall deodhar trees is the Church of St. John in the wilderness which was built in 1852 CE. The stone church is known for its beautiful stained glass windows and is one of the oldest structures in McLeodganj. The church has a gothic character to it and is one of the oldest cathedrals in North India. The premise also has a cemetery which has graves of Englishmen including that of former British Viceroy, Lord Elgin. A short distance away from the centre of McLeodganj, Bhagsunag has a popular Shiva temple. Further ahead of the temple is the waterfall that goes by the same name. It is a nice short hike away to the falls from the temple. Though the falls isn’t a big one, the surroundings are beautiful and the views are lovely. There are a few tea shop en-route and near the falls. Engulfed by cedar trees, the oval shaped Dal lake is a sacred one and there is a fair that is held here every year. The lake offers boating facilities and has a Shiva shrine nearby. This small lake is 2 Kms from McLeodganj and it is a lovely walk all the way. The alleys of McLeodganj are an absolute delight to stroll through. Lined with numerous shops selling myriad items, cafes offering a wide range of cuisines and a vibrant ambience, the heart of this hill station lies in its alleyways. From hippies to Buddhist monks, they are all spotted on these narrow streets that are ideal for a languorous walk in the evenings. Dharamkot is an alternative base to Mcleodganj and is a couple of kilometers further up from the centre. With beautiful views of the surrounding mountains, the place is ideal if you would like to stay away from the crowds of McLeodganj. The place also has its own cafes and guest houses apart from a meditation centre. Dharamkot is popular with trekkers as this is the base for the trek to Triund and further ahead to snowline. The trek to Triund is the most popular adventure activity in McLeodganj and it is a lovely hike all the way with gorgeous views of the mountains and valleys. Engulfing mist, mountain dogs and fellow trekkers are what you encounter on this trek along with numerous tea stalls. Though the trek can be completed in a day, one can also camp atop the summit as there are a few tent providers. The trek further ahead to snowline is also quite a favourite with trekkers. Located in Dharamshala, which is 9 Kms away from McLeodganj, the institute presents the rich Tibetan culture through its workshops where many craftsmen work on their skills. The institute also has a temple which has a Buddha statue along with Buddhist scripts and paintings on display. A major attraction at the institute is the Losel Doll museum, which displays the cultural, religious and theatrical costumes of Tibet through a huge collection of dolls. The monastery is near Norbulingka institute and is also referred as Karmapa monastery as Karmapa, the third in line after Dalai Lama and Panchen Lama resides here. The main shrine houses a large statue of Buddha. The monastery follows Kagyu sect of Buddhism and practices Tantric studies. Mcleodganj is located 9 Kms from Dharamshala in the state of Himachal Pradesh. The closest airport is at Gaggal (22 Kms away) and the nearest rail head is at Chakki Bank (91 Kms away). There are frequent buses between Dharamshala and McLeodganj. There are buses plying from Delhi, Chandigarh, Manali and Shimla to McLeodganj. Absolutely. Am sure you would love it. What a wonderful place... so full of culture and art! Yeah, quite a vibrant place. I love your story about MacLeodganj, make me want to visit one day. I like the architechture and cultures it so beautiful. Thank you for sharing with us. Thank you, glad to hear that. Head there soon. Thank you. That sounds like quite an adventure. When was this?